Welcome to Reiters Reserve, the exclusive retreat and recreation space in southern Burgenland, Austria. You have the choice between the Supreme 5* Hotel (from 16 years, holidays without children) and the Finest Family 4*S Hotel (holidays with children). The award-winning houses are the feel-good poles of the Reserve. Two completely different holiday concepts (only adults, for families) meet here and form a wonderful unit in combination. The infinitely more than just hotels brings a fusion with the whole spectrum of the Reserve. All in all, a complete offer that is as unique as it is incomparable. You will enjoy the finest wellness and culinary delights as well as an infinite diversity: golf, Lipizzaners, wildlife and gardens, sports and leisure facilities or relaxation and dolce vita. Complicated price lists, tables with season times, occupancy dependent prices and similar things were yesterday. At Reiters, the best price applies to each guest. The price ranges can be found on the “sleep” pages. Supreme Room & Suites start at 167 Euro per person per night including half board. Finest Family Room & Suites start at 147 Euro per adult and night with All Inclusive Premium. Here you will find a short overview of the included services in both Reiters Reserve hotels. We guarantee that the best rates are offered on our website and are not undercut by any other site at the time of booking. Online booking is the easiest and most direct way to stay in the Reserve for many reasons. We offer you the lowest rates, do not charge booking fees and our website is protected by the highest security standards so that you can make a booking without hesitation. A look at the website is always worthwhile, occasionally there are special offers exclusively online. We will accompany you through our online booking system and will be happy to answer any further questions you may have. Probably the most convenient method if you want to know a total price for your stay. Always placed at the top of the website, you will find the Book/Enquiry button. Alternatively, you can also check the availability of direct specials and offers. In the search mask you can easily select the number of persons/children and your travel date. Then click Check Availability to see the search results. Your search results include all available rooms and suites. The respective package is displayed with the price per night incl. VAT, excl. local tax. You can get the total price and detailed information about the prices by moving the mouse (on the smartphone) over the respective package name. 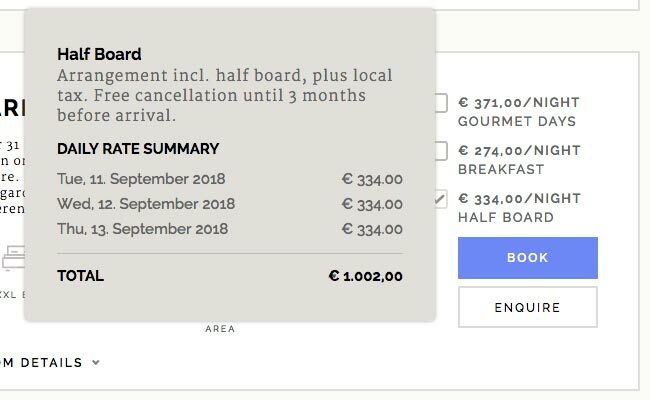 On the search results page, you can either add a room to the shopping cart and complete the booking, or you can email our holiday advisors for further offers and decide later. Select your room with the desired package and click BOOK. In the following shopping cart you only have to complete your contact details, select an additional service if desired and can then complete the reservation with a click on book for a fee. As a rule, payment must be made at the hotel. Some packages require a 100% online prepayment which is processed securely and easily by our payment partner Wirecard. Select a room/suite with the desired package and click on Enquire. Please fill in your details in the request form and click Send. A holiday advisor will send you your individual offer by e-mail. Please note that the offers and their availability cannot be guaranteed at a later date. Our holiday consultants look forward to your call daily from 8am to 8pm. Free of charge within Austria under 0800 310 330 or internationally under +43 3353 8841 we support you with your individual holiday enquiry. WhatsApp and Facebook Messenger are also becoming increasingly popular for hotel bookings. We are available for you via Messenger from 8 am to 8 pm. Simply click on the desired Messenger icon in the footer (desktop) or in the pop-up menu (smartphone). A free holiday advisor will answer you. Status: Last update August 2018, display may differ between desktop and mobile devices.